Some friends asked for this kind of recipe and this is my first attempt. 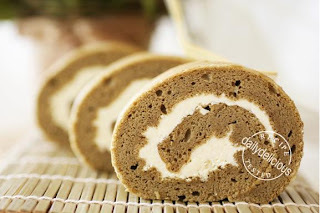 This is soufflé roll cake, the soft cake which I got the recipe from the Japanese bookThe method is different from other kinds of roll cake, the egg white must be cool and the first step is the same as making soufflé base. The cake is very puffy and tender (this is my first time so you can see that the cake has a little hole all around). 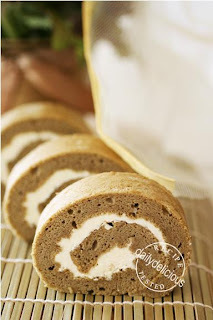 Anyway I think this is quite easy for anyone who wants a roll cake which is soft and it’s not chiffon. Note: The cold egg white method is very good; the meringue is thick, glossy and the bubble is smaller than making with room temperature egg white. Line 30x30 cm rimmed pan with baking paper. Put the egg white into the refrigerator. Sift A ingredients together, set aside. Mix B ingredients together, set aside. Put the butter into the pan and melt over low-heat, when the butter melt immediately add the A all at once and stir continuously with a wooden spoon (or heat resistance spatula). Mix until the mixture pulls away from the pan, forming a ball and remove from the heat. Pour all the milk into butter and flour mixture, whisk to combine. Put the pan over low heat, stir continuously with a wooden spoon (or heat resistance spatula), until the mixture start to pulls away from the pan, remove from the heat. Add the B gradually, mixing the dough until it is smooth. Pour the mixture into large bowl, set aside. Take the egg white out of the fridge, and beat with hand mixer. Beat until soft peaks form add the sugar gradually and beat until stiff peaks form. With a large rubber spatula, gently fold the egg whites into the batter just until blended (being careful not to deflate the batter). Turn onto a lightly damped clean kitchen towel. Trim edges, if necessary; roll cake up, towel and all, while still warm. Let cool completely. Put the sugar and egg whites in a mixer bowl or another large heatproof bowl, fit the bowl over a plan of simmering water and whisk constantly, keeping the mixture over the heat, until it feels hot to the touch, about 2 minutes. Working with the whisk attachment or with a hand mixer, beat the meringue on medium speed until it is cool, about 4 minutes, add the butter a stick at a time, beating until smooth. Once all the butter is in, beat in the buttercream on medium-high speed until it is thick and very smooth, 5-7 minutes. Unroll and fill with buttercream then re-roll cake. Those look so yummy! 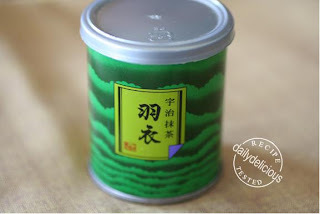 I have been wanting to buy some green tea powder for awhile now. Yours says "no colour" is that common to have colouring in it? 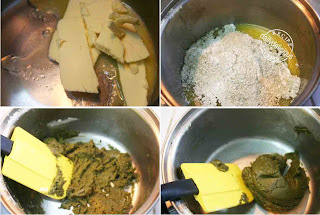 Some of green tea powder that use for baking has color added. If you want the no color one you may need to buy the real Matcha (green tea powder), but the price can be varies. And your cake won't have a bright green color. Ooooh! I've always wanted to try something green tea flavored. That looks so beautiful! Great rolling skill, Nong Pook. I can roll the cake this nice, no crack. Green tea cake is my favorite.... Here in Boston, there is a small Japanese cake shop ( Japonaise) known for it. How is your brother? Recovering well? pook, just find out your blog today.It's very good, you have many yummy collection of cakes and desserts, full of instruction and nice pictures.. thank you for sharing it . beautiful! I'm sure they'll be lovely with red bean paste! Thank for your compliment, and I'm so happy that you like my blog. Yes, it will be a good pairing, green tea and red bean, yummy. This cottony soft swissroll has been tempting me for quite a while...A Qn before i attempt this,isit possible to change the matcha to cocoa powder? 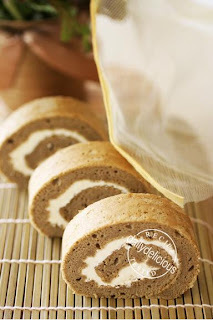 You can change into chocolate roll by using 10g of cocoa powder and 40g of cake flour. thank you very much for answering my post! Another qn...how about if i change it to vanilla flavour?how should i adjust the composition of flour? I see!so i suppose all the rest of the ingredients are kept the same amt? Yes, other ingredients will be the same. Thanks for posting this recipe. I tried this today! Can I check with you : after this step "Pour all the milk into butter and flour mixture, whisk to combine." - my batter is very lumpy. Even when i use my mixer to beat the mixture, i can't get them to be smooth like yours. Do you know if I miss anything? The milk must be cold, so when you pour the milk into the mixture they will be cool. If you use room temperature milk, there can be the problem from the heat that make the milk evaporate and the mixture will be thick not smooth. Thanks Pook, I will try again! when put the base ingredient over the heat, remember to heat it just start to pulls away from the pan. If the base mixture is too hot, the flour will be too thick and the cold milk won't be able to cool them down.